Pine Street Carpenters held its 9th annual “100 Wheels Project” on December 8. 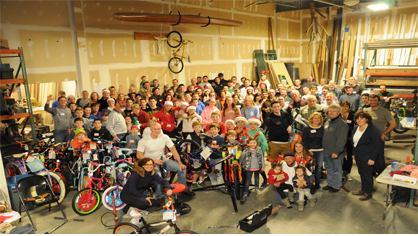 With wrenches and ratchets in tow, over one-hundred volunteer elves descended upon Pine Street’s workshop in West Goshen to assemble 100 bicycles for deserving children in the community. Each December since 2008, Pine Street Carpenters has partnered with local social service agencies and non-profit organizations to identify families and children in need. Bicycles are purchased for each child identified and, once assembled, delivered to the local organizations. Some organizations distribute the bikes at holiday parties; others work with parents to make sure a shiny new bike makes its way next to the Christmas tree on Christmas morning. Since the project’s launch in 2008, Pine Street has built and distributed 740 bikes for deserving children. This year Pine Street partnered with ten non-profit agencies throughout the region, the largest number since the 100 Wheels Project was established. These organizations include: Family Services of Chester County (West Chester); Friends Association for the Care and Protection of Children (West Chester); Saint Agnes Day Room (West Chester); The Care Center (West Chester); Chester County Family Academy (West Chester); La Comunidad Hispana (Kennett Square); Family Services of Montgomery County (Norristown); Stewart Middle School (Norristown); Home of the Sparrow (Exton); and Delaware County Children and Youth Services (Upper Darby). To learn how you can support “The 100 Wheels Project,” visit www.bikebuild.org.